The Smokeless Log holds a gel cartridge. The cartridge produces a clean burning fire with no smoke or odor. It is non-toxic and contains only virgin alcohol, water, and a tiny bit of thickener. Cartridges are completely safe and are 100% recyclable, just like any other metal can. 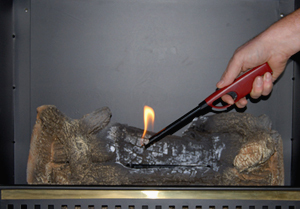 To start a fire simply open cartridge, insert it into any of our log designs, and light the cartridge with a long match or lighter. 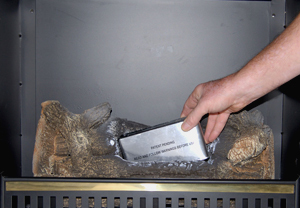 The fire will burn over 2 hours and can be extinguished any time with the Snuffer Plate that comes with every case of cartridges.